Fatih Mosque. It was contructed on the fourth of seven hills of Istanbul. The kulliyah was constructed upon the remnants of The Church of the Holy Apostles which was the patriarchal Church of the Eastern Roman Empire. The mosque and the kulliyah are among the first examples in Istanbul which was turned into an Islamic identity after the conquest. Unfortunately we do not have sufficient information about the architecture of the first building built by Mehmed II between 1461 and 1470, and almost ruined at the earthquake of 1766. We know that the architect was Atik Sinan. 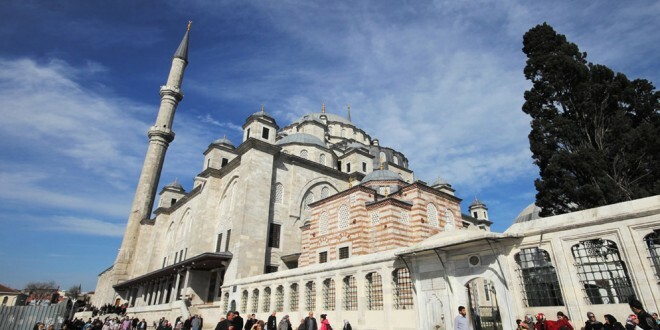 The mosque which was almost demolished at the great Istanbul earthquake of 1766 has had its modern version during the reing of Mustafa III was built by the famous architect Mehmet Tahir Aga in 1771. It carries the baroque architecture of the mosque is set on alarge area. It was built as madrasah, school, library, imaret, inn, hospital and Turkish bath. Some part of it is demolished todar. The entrance is through two high and magnificent Gates. There is a water tank in the middle with octangular marble comers and in the form of columned coif. There are eight madrasah in kulliyah part of the mosque. The madrasah of Mehmet II have been famous in this respect. It was a privilege tp be a learner or instructor here. The names of the madrasah were Akdeniz (Mediterranean) and Karadeniz (Black Sea). The names of the Akdeniz are Akdeniz, Baskursunlu, Ciftekursunlu, Ayakkursunlu. Also there are Tehime and Semaniye madrasah. These do not exist today. In the greater yard which has two entrances from the front side the madrasah have closed the yard as blocks.